WASHINGTON (AP) - Sen. Kirsten Gillibrand is expected to move toward launching a 2020 presidential campaign within days by forming an exploratory committee, according to several people familiar with her plans. The New York Democrat will likely announce her intentions ahead of a trip to Iowa this weekend, one person said. She will be a guest Tuesday night on CBS' "The Late Show with Stephen Colbert." The people spoke to The Associated Press on condition of anonymity because they weren't authorized to speak on Gillibrand's timing. Gillibrand's representatives didn't comment Monday on her plans. Gillibrand would become the fifth Democrat - and second senator - to jump into a presidential primary that could ultimately feature dozens of candidates. Sen. Elizabeth Warren of Massachusetts along with former Obama Cabinet member Julian Castro and Rep. Tulsi Gabbard of Hawaii are among those who have taken steps toward a 2020 run. Sens. Cory Booker of New Jersey and Kamala Harris of California could also enter the race soon. 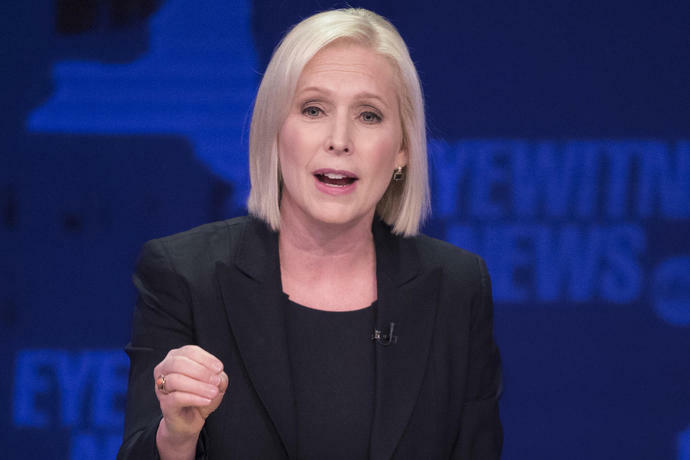 While Gillibrand's prominence as a face of her party has grown, she faces a tough battle to capture the attention of Democratic voters in a crowded field that's expected to include multiple women. Several of her potential rivals have spent more time in critical primary states while Gillibrand has visited one - New Hampshire - in October to stump for the Democratic candidate for governor. She's expected to move quickly this week to make connections in the leadoff caucus state of Iowa. She's scheduled to headline a meeting with Democratic activists in Sioux City on Friday evening. The event is to be held at a private home with top donors to the Woodbury County Democratic Party. Gillibrand has been in touch with some Iowa Democrats and enlisted the help of Lara Henderson, who was finance director for Fred Hubbell, the 2018 Democratic candidate for governor. But she hasn't built up a network in the state to the degree of prospective rivals, including Booker and Harris. She was appointed to the Senate in 2009 to succeed Hillary Clinton, who became secretary of state, and she easily won re-election, most recently in November. She has $10.6 million in her campaign fund, which can be used to jump-start a presidential bid. During her time in the Senate, Gillibrand has been a central figure in Washington's reckoning with the #MeToo era. Associated Press writers Michael Balsamo and Julie Pace in Washington and Thomas Beaumont in Des Moines, Iowa, contributed to this report.